EAST PALO ALTO, Calif. (KGO) -- A stray puppy that had its muzzle tied shut in East Palo Alto last month is ready for adoption, according to the Peninsula Humane Society and Society for the Prevention of Cruelty to Animals. 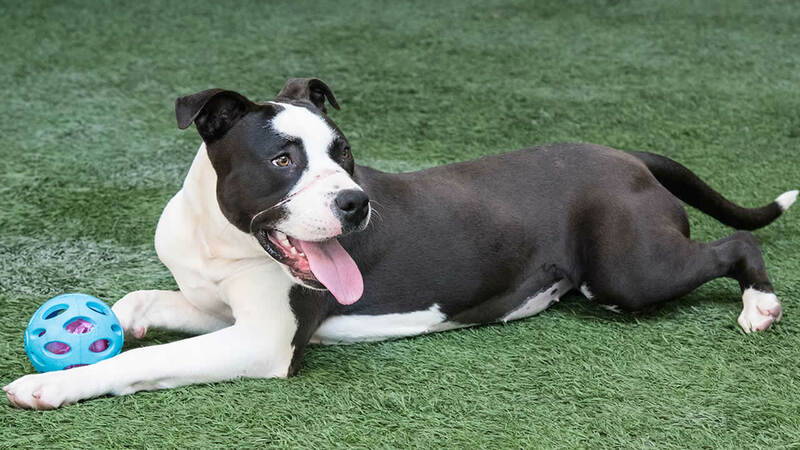 "Gabby," the black and white female pit bull terrier, is almost a year old. She was found on May 19 with a bloody and badly swollen muzzle, as well as infected scar tissue on her neck and legs. Buffy Martin Tarbox, communications manager for the PHS/SPCA, said the pup's injuries were consistent with having her muzzle tied shut. Gabby is fully healed now, though, and ready for adoption. She's also been spayed, microchipped and vaccinated. People interested in adopting Gabby can find her at the Tom and Annette Center for Compassion, 1450 Rollins Road in Burlingame. The adoption fee is $120. Click here for more stories about animal rescues.